Over the summer, Shadowhunters fans really went all out in trying to save their beloved show. 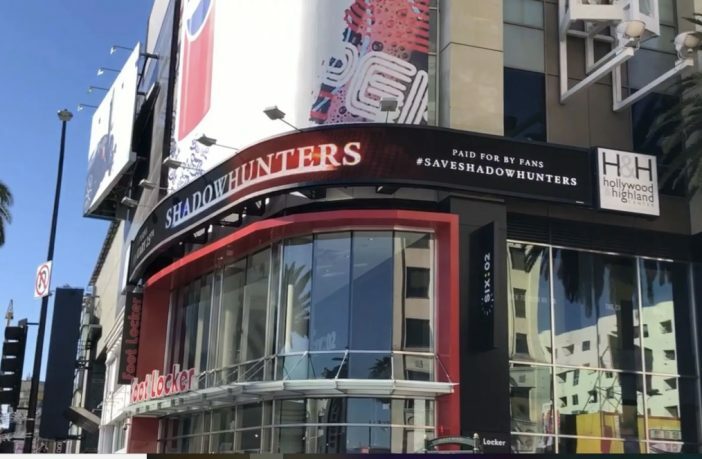 With #SaveShadowhunters campaigns running all over the world, #SaveShadowhunters content hit Hollywood, London, Korea, and New York. Although these efforts were largely ignored by the “higher-ups”, it seems that fans aren’t quite ready to give up. 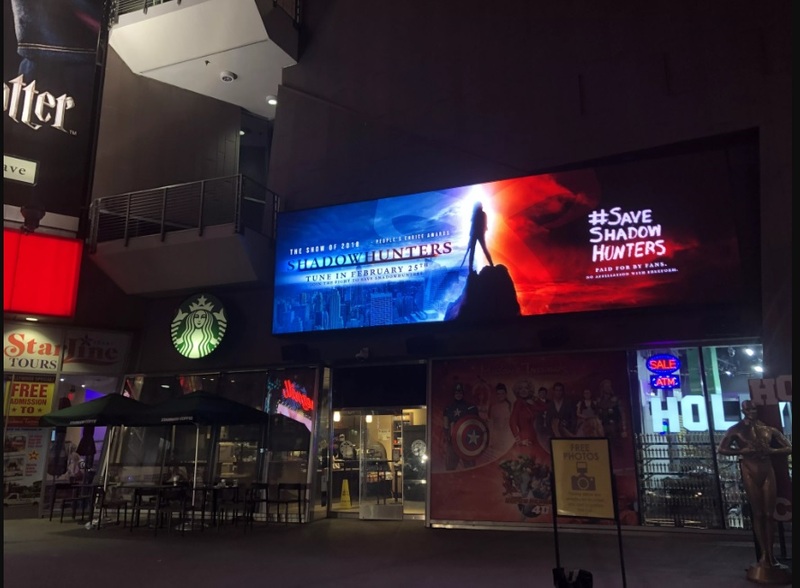 Sighted earlier this week in Hollywood was the return of the #SaveShadowhunters campaign, with two digital billboards on what will soon be the Oscars red carpet strip. It seems these efforts are, at least in part, just trying to bring attention to the show’s final run of episodes, which Freeform has barely bothered to promote. You can find the first digital banner on the corner of Hollywood Blvd. and Highland Ave., appearing every few minutes showcasing the name of the series and the premiere date of Shadowhunters 3B. And just yesterday, a second billboard appeared one block west, at the intersection of Hollywood Blvd. and N. Orange Dr. With a silhouette of a “Clary Fray-like” hero standing between what appears to be New York City and Edom, this second billboard highlights a recent series and fan achievement: Being awarded The Show of 2018 at the People’s Choice Awards. Definitely, the relationship between the Shadowhunters cast and its fans is a unique one. They’re constantly interacting and supporting one another, and this time is no different. 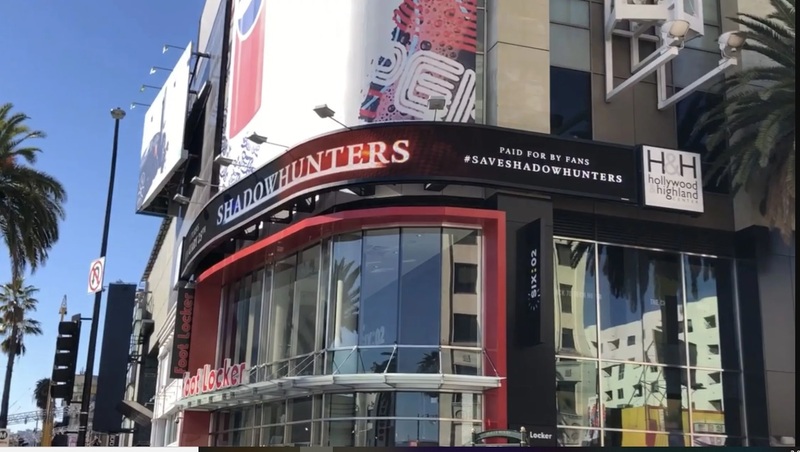 Cast members Kat McNamara and Luke Baines were actually two of the first people to hunt down and tweet about these #SaveShadowhunters billboards, thanking fans and celebrating right alongside them. YOU GUYS GOT A BILLBOARD IN THE MIDDLE OF HOLLYWOOD AND @Kat_McNamara + I ARE HERE LOSING OUR MINDS. YOU RULE! In case you missed the memo, Shadowhunters 3B premieres February 25th on Freeform.